Serhiy Burov is a Ukrainian advisor and teacher of human rights and civic education. His life and work have been led by his strong passion for and belief in human rights education. He is the director of Educational Human Rights House Chernihiv. 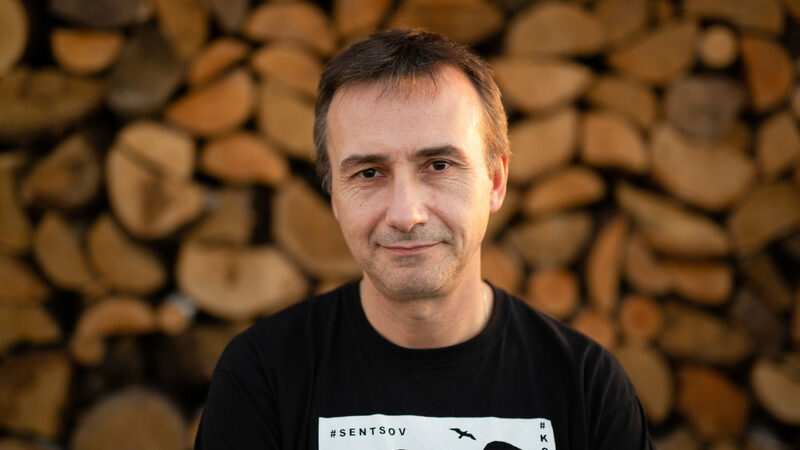 In this interview with HRHF, Burov explores his path into human rights education and discusses the origins of the House in Chernihiv. He talks of the issues around opening the House amidst the chaos and aftermath of Euromaidan, and on how the House continues to overcome human rights challenges. Burov is only too aware of some of the challenges in promoting human rights in Ukraine, but he is also sure of the opportunity to break through and improve lives with education in human rights. He heralds the importance of the long-lasting effects brought about by education. “When we work with young people, they are still searching for their paths in life. We suggest human rights to them as a sphere of self-fulfilment. Later, when young people better understand what they want to do in life, they can apply this knowledge in different areas of their lives, both professionally and in their civic activities. Burov graduated as a teacher of history and began working in a high school in 1997. His experiences shaped his passion for education in human rights. To find answers for the questions from his students, Burov began to research key issues and discovered organisations such as Amnesty International and Ukrainian human rights groups in Kharkiv and Vinnytsia. He started teaching his students civic education, law, history, and current events, and engaging them in assignments such as comparing the Ukrainian constitution on paper against the reality in the country. As a teacher, his students energised his interest in human rights that was first sparked when he himself was a teenager – during his conscription into the military of the Soviet Union from 1988-1990. I saw first-hand the effects of conflict – I was standing on blocks, talking to people, taking photographs of destroyed houses, witnessing killed Meskhetian Turks in Uzbekistan. At the age of 18, it was a shock. Burov refers to the years in the army as an important milestone for his subsequent human rights activism. The story of the establishment of the House in Chernihiv is tightly bound to the establishment of the Belarusian Human Rights House. In 2006, the founding members of the Barys Zvoskau Belarusian Human Rights House were aiming to set up a Human Rights House outside of Belarus, due to the impossibility of operating within the country. During this process, Burov proposed to Human Rights House Foundation almost jokingly: “let’s set up a House in Ukraine”. It would take another eight years before Educational Human Rights House Chernihiv was established. Burov and his colleagues Volodymyr Yavorskyy and Roman Romanov began to discuss the need for a Ukraine-wide human rights education programme. A year later, MART and Ukrainian Helsinki Human Rights Union began the practical implementation of these plans with support from Norwegian Helsinki Committee and International Renaissance Foundation. 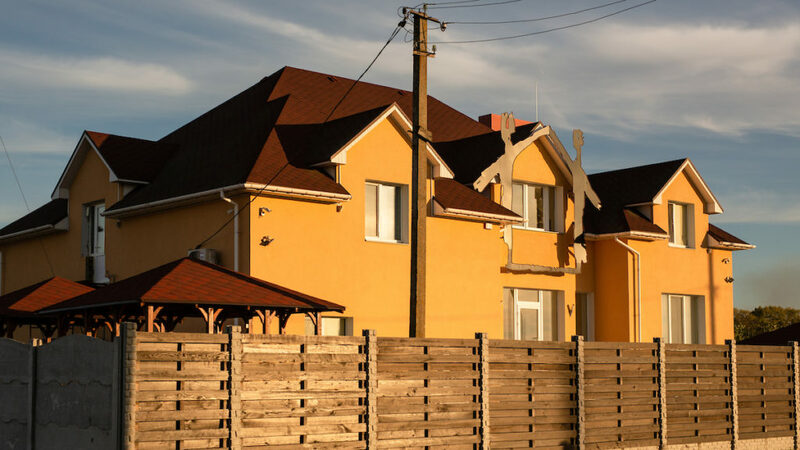 The programme and the people behind it became the basis to establish the House, and were a deciding factor in the House being established in Chernihiv rather than in Kyiv. Burov was involved in two of these organisations – the Ukrainian Helsinki Human Rights Union and MART– and was a key figure in the establishment of the House. When establishing the House, the founders already had the idea that different regions of Ukraine could have different thematic Human Rights Houses based on the expertise in those regions. Crimea could have specialised in the area of multiculturalism, Western Ukraine in ecological problems, and eastern Ukraine as the country’s centre for strategic court cases. Yet these ideas were soon complicated by Euromaidan and the events that followed. The establishment of the House took place during the chaos and the aftermath of Euromaidan, with the physical premises of the House purchased in January 2014. The months that followed saw the organisers of the human rights school adapt rapidly to changing human rights needs in Ukraine. 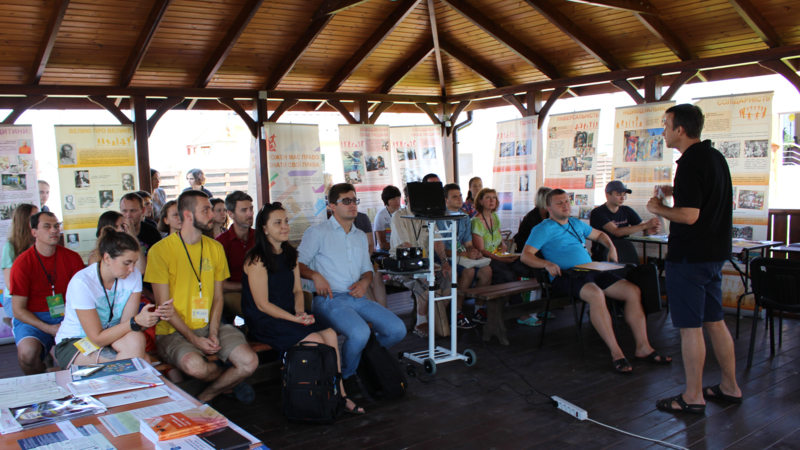 Educational Human Rights House Chernihiv hosted an event on human rights in Crimea in connection with #26SOLIDARITY, a global campaign in support of Crimean political prisoners. Photo: Educational Human Rights House Chernihiv. 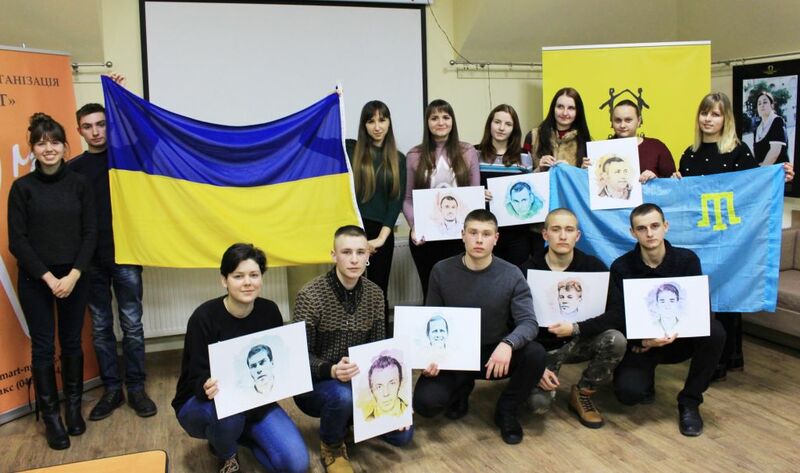 On 26 February 2018, Educational Human Rights House Chernihiv hosted an event on human rights in Crimea in connection with #26SOLIDARITY, a global campaign in support of Crimean political prisoners. When Euromaidan started, the founders of the House all worked individually. They contributed to the Euromaidan project and monitored it. In February 2014, when the process to open the House began, the members contacted young activists to tap into their activities. The human rights school taught young activists effective things that they could do during Euromaidan, encouraging them to join the initiatives of the House founders and their partners. During the next human rights school in the summer of 2014, before the renovation of the House premises, participants lived in tents with classes taking place in unrenovated rooms. “This was also quite challenging – the focus was on the annexation of Crimea and the outburst of military activities in Eastern Ukraine. In this human rights school, we invited those directly affected by these situations. We discussed not only human rights, but also what we can do in these situations. The primary focuses of the House are human rights education, advocacy, and protection. Through its work, the House attempts to reach out to youth activists, teachers, and schools, and to lawyers, judges and the legal system in the country. “We have many target audiences, but our main point is education. The value of the House is that the members are very different; these organisations target different people – giving us an opportunity to work with many different audiences in parallel. The House’s educational programmes are developed based on international human rights standards, and the national implementation of these standards is at the heart of the work of the House. The House is part of the International Law in Advocacy (ILIA) programme by Human Rights Houses, which aims to extend the knowledge and experience of lawyers in international human rights standards and protection. Serhiy Burov leads a discussion as a part of Educational Human Rights Fest 2018. 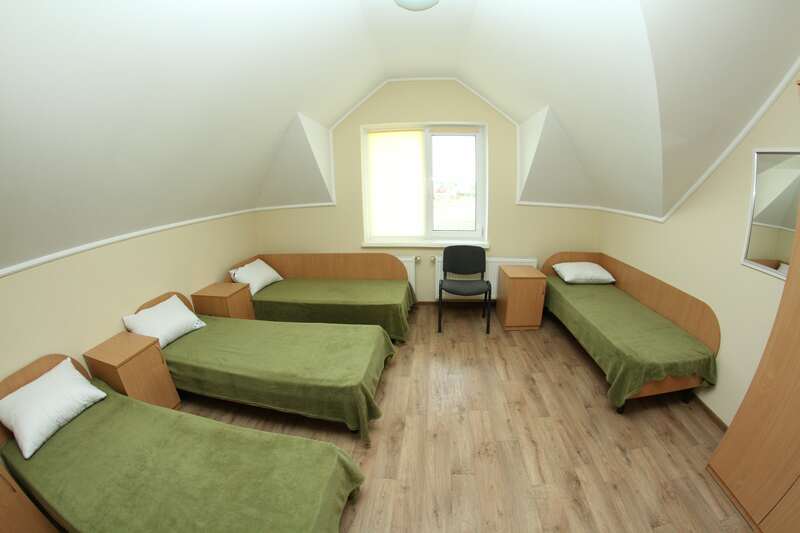 Photo: Educational Human Rights House Chernihiv. In 2017, the House began to host the annual human rights education festival, which has become one of the largest human rights festivals in Ukraine. The second festival, held in 2018, took place over nine days and hosted more than 50 speakers and around 150 participants. It included lectures, discussions, cinema shows, master classes, musical evenings, and excursion tours around Chernihiv city, as well as swimming in the lake, yoga, and friendly evenings near the fireplace. Alongside the Belarusian House and Human Rights House Tbilisi, the House in Chernihiv engages in protection work with Human Rights House Foundation, and functions as a shelter protecting human rights defenders from different countries and situations. In 2018, the House sheltered people from Afghanistan, Azerbaijan, and Uzbekistan. It also helped people fleeing Crimea and the conflict zone in eastern Ukraine. Staying busy and feeling useful is something else that people can need in these situations says Burov, who cites the example of two Azerbaijani journalists that stayed at the House for a short period. “We are involved in regional projects and partnerships because solidarity matters… The universal declaration of human rights: this is solidarity, people from different countries coming together and rejecting the wrongs happening in other parts of the world. We all live in different counties, but we can have similar problems or see good and bad practices repeating. Burov mentions specifically the common history of at least 70 years that Ukraine shares with Belarus and Russia. “We try to use human rights as a tool to change the attitudes in society… unfortunately we have a new trend where defenders can be assaulted by people close to the authorities, and the police are often unwilling to investigate, or they conduct very ineffective investigations. Working to overcome these challenges, Educational Human Rights House Chernihiv is running programmes that aim to engage with authorities and support independent organisations working on human rights. “Previously, we tried to partner with the government on the issue of human rights in schools. We called for a systematic approach to human rights but this failed, so we decided to have a parallel system. This system is a large effort including self-assessment of the general human rights environment in the school – where the school assesses whether they can be called a human rights zone. House members are also leaders in providing training to people independently monitoring prisons in Ukraine, and member MART has partnered with the House and the minister of justice to implement higher standards for the programme of the preventing juvenile crimes. The member organisations also cooperate with government ministries regarding the conflict in the east – documenting and collecting evidence.